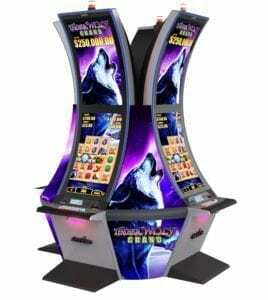 Timber Wolf Grand offers players 2,000 ways to win, with Xtra Stacking symbols, progressive multipliers, and the chance to achieve a full screen of high-paying Wolf symbols. An exciting Wheel Feature retains the popular Grand Series dual wheel bonus and awards free games and progressive jackpots that can be multiplied up to 10x. Plus, the Free Games Feature awards an unlimited free games bonus, with the action of x3 and x5 wild multipliers and reel re-spins for rich rewards.